What!? wrote: What exactly is Advent's evolution line? Yes, but after that I evolve into Charizard. So, you are somehow related to Charmander? He's my cousin. My mama Rapidash knocked up a Charmeleon. I guess that would make Advent a Fire-type. Well, if I went on to the grandparents and further, it'd be just be a bunch of repeats. If you go even farther back, you would notice that Advent is the only Advent there. Haseo wrote: *evil snicker* Advent, you are now not only dead, but a... *snicker* pretty pony! 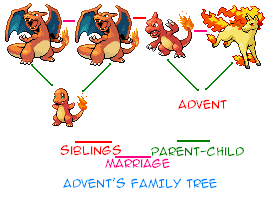 If you went far enough back in Advent's family tree, I'm sure you'll find a Mudkip. I did, there isn't, only fire-types. What about a fiery Mudkip? *Tigerstar runs through the thread with many horses behind him* For PrettyPonyClan! A magical new species perhaps? Or perhaps some fool hacked Advent's genealogy.